Provides power and data using built-in IEEE 802.3af PoE on all 24 ports. A web-based management tool for quick and easy deployment and configuration. Four gigabit ports for high speed connections. Easy-to-manage web-based GUI. By buying this product you can collect up to 41 loyalty points. Your cart will total 41 points that can be converted into a voucher of CAD$4.10. 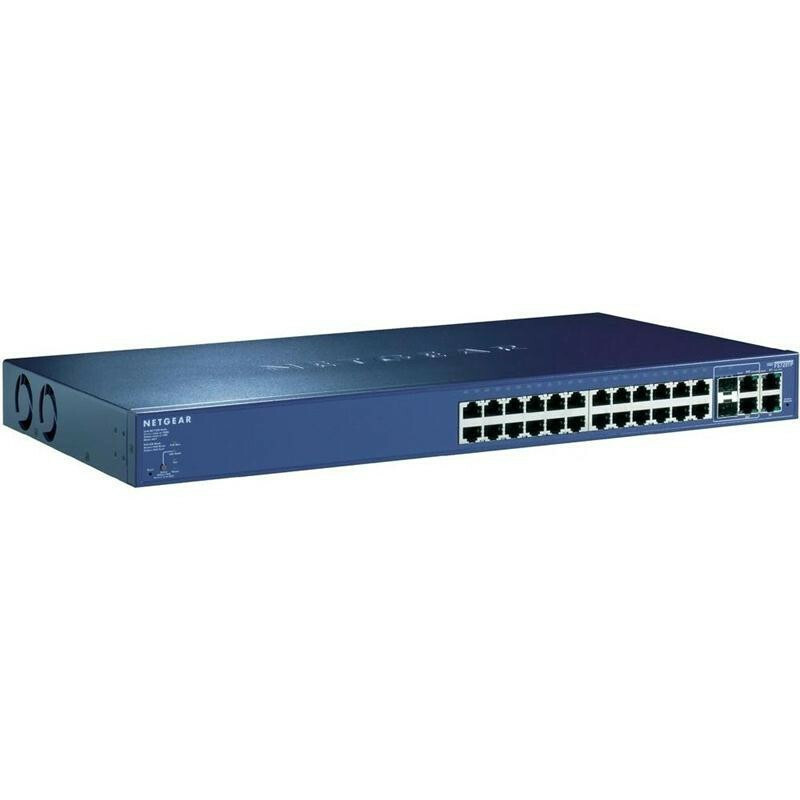 This switch is equipped with highly advanced features such as access control Lists (ACL), 802.1x port authentication, enhanced QoS, rate limiting and IGMP Snooping among others to provide a small and medium-sized business with a network that is geared for growth while providing scalability and reliability. With the utility of 24 10/100 Mbps ports, two copper 10/100/1000 ports and two combination (Copper/hot- swappable Small Form-factor Pluggable (SFP)*) Gigabit ports for optional fiber connectivity, growing business networks, classrooms and workgroups can benefit from superior performance and keep up with expanding network needs. This high performing switch features a non-blocking wire-speed architecture with an 12.8Gbps switching capacity for maximum data throughput. All 28 RJ-45 ports automatically negotiate to the highest speed and support auto Uplink technology to make the right link. This PoE capable Smart Switch, the FS728TP, provides power and data using built-in IEEE 802.3af PoE on all 24 ports. In addition, the FS728TP offers an intuitive web-based management tool for quick and easy deployment and configuration making it ideal for deploying access points, VoIP phones and IP-based surveillance cameras. 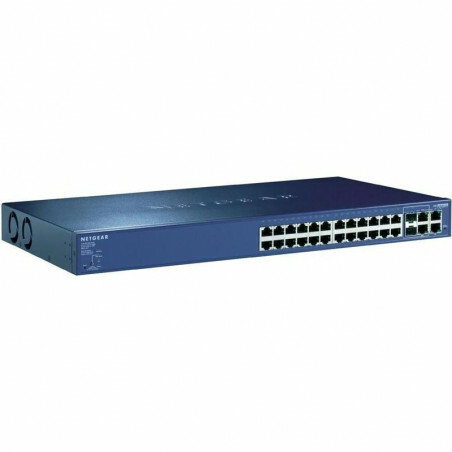 This switch is equipped with highly advanced features such as Access Control Lists (ACL), 802.1x port authentication, enhanced QoS, rate limiting and IGMP Snooping among others to provide a small and medium-sized business with a network that is geared for growth while providing scalability and reliability. With the utility of 24 10/100 Mbps ports, two copper 10/100/1000 ports and two combination (Copper/hot- swappable Small Form-factor Pluggable (SFP)) Gigabit ports for optional fiber connectivity, growing business networks, classrooms and workgroups can benefit from superior performance and keep up with expanding network needs. There are some good points about this unit: its price (a low cost solution for a VoIP network), the hardare waranty and the fact that blue is a color i like. It has no serial port, no firmware recovery procedure and the web interface only allowed for 2 connections from the browser, whereas my browser by default tried somewhere north of 10. What this does is cause the interface to not load completely. Known issue and easy enough to fix in the browser itself. This is more or less an annoyance. I have other Netgear products that I like so I don't have a problem with Netgear brand but this unit is not good at all. I'd suggest to someone not getting this specifically for only VoIP traffic to look elsewhere. I love it. This is very inexpensive, and does everything I need it to. Just finished a "Smart Home" installation. There were 15 in-wall touch panels and a few other devices that receive power over Ethernet. This switch requires no setup, and truly was "Plug and Play". Much better than using single device PoE injectors! This device serves its purpose very well. I do recommend it! Rock solid construction. Cheap, 4 gigabit ports, plenty of power for POE. I have 10 phones on this switch, and haven't had any serious problems. It's great for powering voip in small office applications or even medium office app. Working great with a number of Cisco SPA phones using the auto POE detection. Running numerous other computers, printers etc without a hitch. Make sure to install this in a closet or somewhere to isolate the fan noise. Only gigabit is the uplinks not the switch.